Waste Segregation and Hygiene at Source (Shop to Shop awareness Campaign). taking promise from shopkeepers to get their waste aggregated at source and no littering campaign. Commitment to be part of Reduce, Reuse and Recycle campaign. Anti Maleria, General Hygiene and Waste Segregation (Door to Door awareness Campaign). You are invited to join TRISHUL (NGO) as a volunteer for beach clean up program. Location: Sagar Kutir Imperssion Point, Seven Bunglows . 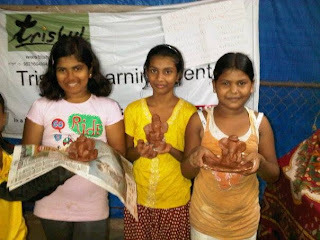 Objective of drive: Doing our bit to promote - ECO - Friendly Lord Ganesha Festival. Doing our small bit as citizen towards Cleaner Mumbai and a Better World. We will be joining the Beach Cleanup drive .. supporting BMC and other volunteers working towards cleaning beach during last day of Immersion (Lord Ganesh Utsav). Our Role - Guiding people to segregating and requesting people to deposit their segregated non-decomposable plastics, garlands in Nirmalaya Container / Bins provided by BMC at various locations. Segregation at source is important because once the flowers, waste vegetables get mixed with other garbage it can't be used to make good compost. Good compost is useful as organic fertilizer / top soil and help in quick recycle of waste generated. Water bottle; small flash lights and personal snacks in small backpack or napsack.